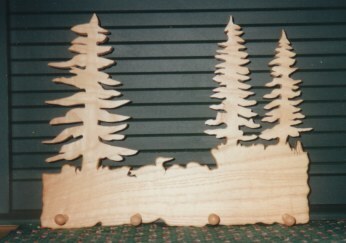 I'd like to share my fathers talent for custom wood designs/sceneries. For several years, as time allowed while he was working, my father has reproduced his wildlife memories through wood working. He possesses as much enjoyment working with wood as he does for fishing, big game, upland and waterfowl hunting. Now that he has retired, he has the time to share it with the rest of us! Throughout the years, he has manufactured items that include wildlife, fishing and hunting. The item he has designed that gets the most use in my home are his coat/leash/collar hangers. With the limited items available representing the "Braque du Bourbonnais" breed, I requested that he design a hanger that would match my Labrador hangers he previously made. To my delight, he manufactured one as a gift for me! Braque du Bourbonnais with pine trees and grouse hiding behind a tree stump. Braque du Bourbonnais with cattails and quail hiding behind switch grass. Of course, because the above hangers display the Braque du Bourbonnais, they are my favorite. 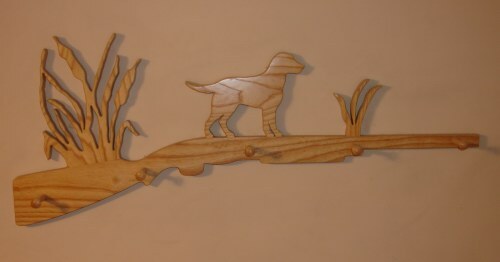 Below are a few samples of other canine companion hangers he has produced. Our hangers hold coats, leashes, collars and hunting gear. Each hanger (in addition to the canine companion of choice) can be customized with pine trees or cattails, tree stump or switch grass and with or without the "hiding" gamebird. He uses quality materials and utilizes the unique wood grains and shades in producing each piece. No two hangers are the same. Braque du Bourbonnais with pine trees and grouse hiding behind tree stump. Ash and Birch woods used. Braque du Bourbonnais with cattails and quail hiding behind switch grass. Ash and Birch woods used. Chesapeake with cattails and switch grass. Ash and Birch woods used. German Shorthair with cattails and switch grass. Ash and Birch woods used. Labrador with cattails and switch grass. Ash and Birch woods used. Vizsla with cattails and switch grass. Ash and Birch woods used. Sloughi's with horse. Ash and Birch woods used. Italian Greyhounds. Ash and Birch woods used. Braque du Bourbonnais' (adult and pup) with pine trees and quail hiding behind switch grass. Duck landing with cattails and switch grass. Ash and Birch woods used. Elk with pine trees. Ash and Birch woods used. Horses. Ash and Birch woods used. Fly fisherman with pine trees. Ash and Birch woods used. Fisherman with hat in boat, pine trees and fish. Ash and Birch woods used. Fisherman with cap in boat, pine trees and fish. Ash and Birch woods used. The above are only a few samples of his hanger designs. Drop us an email with your companion breed or favorite wildlife animal. They are ~36" long and have five hanger pegs. Three screws are included for the mounting holes which are 16" apart (under the left, center and right pegs), to align with studs in a standard wall. The sample below is a key hanger. Key hangers are ~12" long and have four hanger pegs. When ash and birch wood is used, the estimated delivery time is ~4 weeks. The ~36" hangers run $85 US plus S & H and the ~12" hangers run $45 US plus S & H. Specialty woods are available upon request for an additional charge and take ~6 weeks delivery time. Loon swimming with pine trees. Ash and Birch woods used. If you are interested in the above hangers, please print and complete the following order sheet. 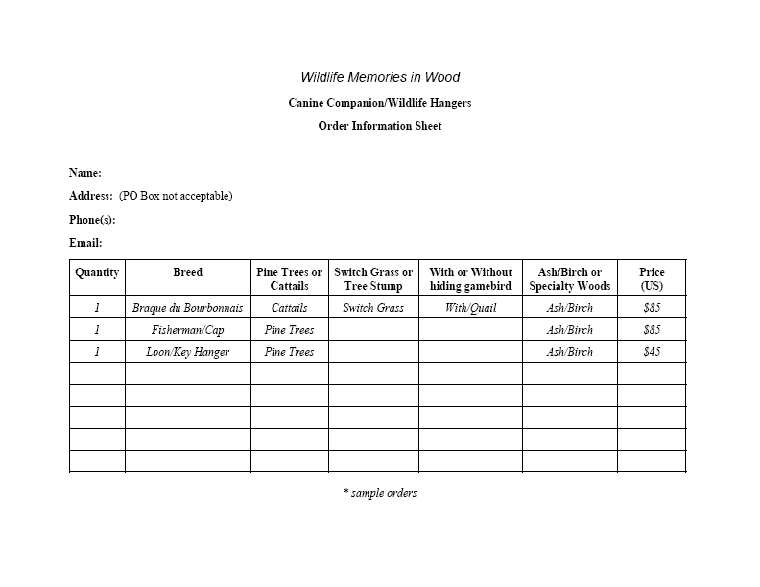 Once the order sheet is received, an invoice will be emailed to you which will include Shipping & Handling. Payment in full is due prior to order being produced.